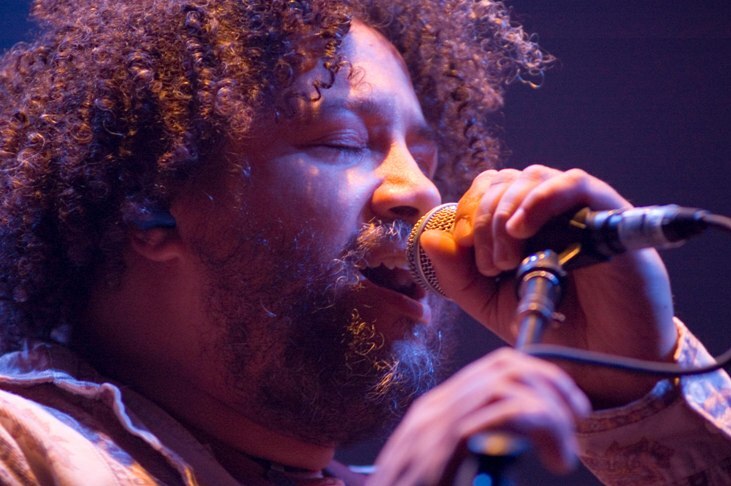 On Thursday February 22nd, perennial jam band favorites Rusted Root made their return to the Washington D.C. institution the 9:30 Club. With hundreds of shows under their belt from coast to coast they've managed to garner a large fan base in the Capital area. On tour with them came a little known band named Quintus from New York. This young and very talented group utilized catchy guitar riffs, even catchier lyrics, and solid musicianship. It's always refreshing when a young band takes the time to focus on quality song-writing, thoughtful lyrics, and harmonies instead of trying to emulate the bland top forty genre that is too prevalent today. The group's EP titled "The Shape We're In" is a quality six song offering which is well worth the price of purchase via Itunes. Look for these guys to become much more popular in the years to come if they continue on their current path. After a solid set from Quintus and with the crowd inside the club rapidly expanding, Rusted Root took the stage around 10pm. This tour is likely to be a bittersweet one for both fans as well as the band due to the impending departure of longtime band-mate Jenn Wertz. Wertz contributes an invaluable dynamic to Rusted Root with her soulful bluesy vocals and signature harmonica playing. However if there was sadness in the room it was immediately forgotten with the first beat of the drum, and powerful strum of Michael Glabicki's guitar. The cramped crowd immediately got into the music and the band seemed to feed off of their energy. The band seemed so much more lively than the previous time I had seen them, I can only attribute this to a crowd which was into their music and not a festival crowd. Either way everything about the opening of their show was as vibrant and powerful as it could have been. After a about 30 minutes, the band changed it up and went acoustic with bassist Patrick Norman bringing out an acoustic bass and John Buynak finishing out the texture with some fantastic jazz flute. A highlight of the show was certainly an acoustic version of "Send Me On My Way" one of their most well known songs. However playing hit songs or not, Rusted Root is one of the few bands which has the rare talent to illicit the same energetic response from fans as if they were playing electric. Last Thursday was just another occasion of Rusted Root proving that they're still relevant and deserving of your attention well into their second decade as a group. Their songs and tenure as a band have made them favorites of fans from across all generations. I for one hope they continue to make music and inspire new bands for years to come.